For the month of May Friends of the Earth are encouraging everyone in the UK to count the bees in their garden. I will be joining in sometime over the next week, hopefully on a nice sunny day that will bring all the bees flying by. All you need to do is watch for bees in a 1 metre by 1 metre section of your garden with flowering plants, and count how many bees you see in two minutes. 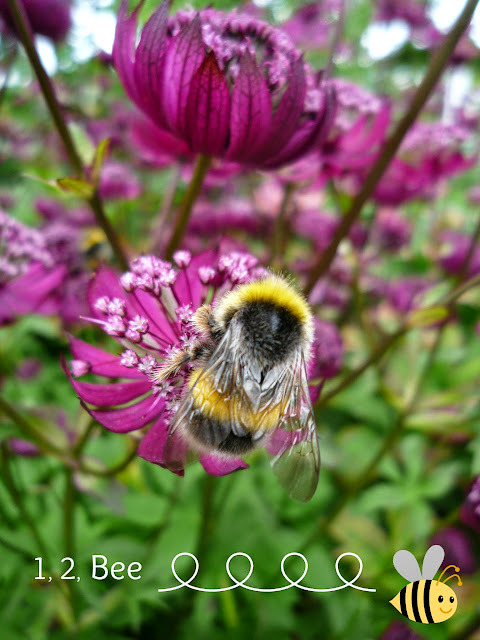 You need to download the Great British Bee Count app to your phone or tablet. Bees help pollinate hundreds of our main crops including apples, strawberries and tomatoes. Without bees we can kiss goodbye to gran’s apple crumble, strawberries & cream (and even that cheeky gin & tonic). The UK has lost a shocking 20 species of bee, and a further quarter are on the red list of threatened species. A big reason is that bees depend on flowers for food - and in the past 60 years 97% of our wildflower meadows have disappeared. But the good news is that you can help change things. By planting flowers rich in nectar and pollen you can start to replenish their lost habitat. *Bee facts supplied by Friends of the Earth. That sounds like a great idea and should keep my children occupied too! We have just planted some bee friendly plants and herbs in our new place to help encourage the bees back. That's great! a lot of countries are working together in this initiative. Bees Matters! Beautiful picture by the way!